The Syrian Civil War has been a complex situation since the 2011 Arab Spring protests and revolutions. Syria is one of the most unstable regions in the world. 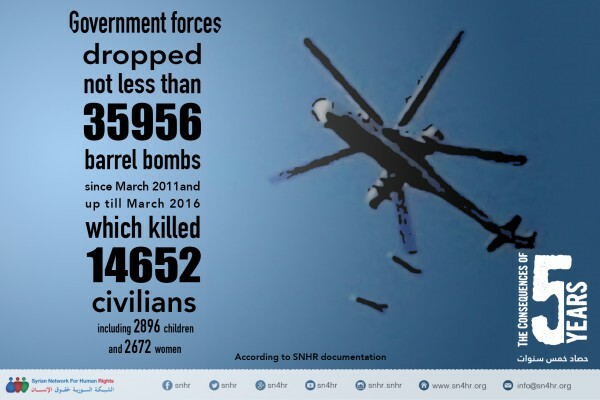 According to iamsyria.org the death toll is more than 500,000 since 2011. Cries from Syria aired March 2017 on HBO. Like The Killing Fields (1984), Mayrig (1991), Schindler’s List (1993), Hotel Rwanda (2004) or Blood Diamond (2006); Cries from Syria reveals the horrors and madness of genocide. Yet, unlike these other movies the victims are not actors – but mostly innocent men, women and children dead or dying in front of your faces. Children can be seen choking to death on Sarin gas; staving to death; and testimonies about thousands of the tens of thousands of Syrian protesters arrested and never seen again. Tens of thousands have been killed by the Syrian government, that has worked with ISIS and the Russians. It makes you question the leaders of the world and how such ungodliness can be allowed. All adults should watch these movies, lest many live selfish lives without a care for others. October 1918: A month before the end of World War I, Arab troops led by Gen. Feisal and joined by British forces captured Damascus and ended four centuries of Ottoman rule. March 1920: Emir Feisal was proclaimed King of Syria by the Arab National Congress. He was the son of Sharif Hussein bin Ali, Sunni Emir of Mecca. June 1920: Syria-Lebanon territory was put under a French mandate and Palestine under a British mandate by the Allied Supreme Council and the League of Nations. 1925: Organized Arab/Muslim protests and uprisings occurred against French and foreign control. 1941: During WWII, General De Gaulle promised to end the French mandate in Syria. August 1943: Shukri al-Quwatli became president of Syria and was reelected in 1948. April 1946: Syria gained independence from France. April 1947: The Ba’ath Party was founded through a merger of the Arab Socialist Movement and the Arab Ba’ath Movement. In 1966 a coup would split the Ba’ath Party and it would be dissolved. 1949-1955: Syria was filled with coups and revolts. February 1958: Egypt and Syria formed the United Arab Republic (UAR) or Al-Jumhuriyah al-Arabiyah al-Muttahidah. It ended in September 1961 following another coup, when Syria declared independence from Egypt. June 1967: Israeli forces take the Golan Heights from Syria in the Six Day War with Egypt, Jordan and Syria. November 1970: Al-Assad seized power over Gen. Salah Jadid, overthrew president al-Atasi and then proclaimed himself leader of Syria. March 1971: Hafez (Hafiz) al-Assad became the 18th president of Syria. He would rule as a dictator until his death in 2000. He offered Syrian alliance to Russia (the Soviet Union). During his reign Sunni leaders became heads of the government and Shia Alawites the heads of the military and intelligence agencies. October 1973: Syria and Egypt returned to war with Israel. November 1979 to January 1981: President Carter’s administration mishandled the 444 day Iran hostage crisis. 1980: The Muslim Brotherhood (Society of the Muslim Brothers) founded in Egypt 1928, began to rise in Syria. After the Islamic Revolution in Iran, Muslim groups in Syria began to riot in Aleppo, Homs and Hama. September 1980: Syria backed Iran in the Iran-Iraq war in which a half a million to a million people were killed. Iraq is most Shi’a Islam and Iran about 90% Shi’a. February 1982: The Hama Massacre: President Hafez al-Assad razed the city while crushing a Muslim Brotherhood Sunni rebellion. Between 30,000 and 40,000 civilians were killed. Theguardian.com stated, “The 1982 massacre is regarded as the single bloodiest assault by an Arab ruler against his own people in modern times and remains a pivotal event in Syrian history.” Damascus, Aleppo and Latakia also suffered casualties. 1990: Iraq invaded Kuwait and Syria joined the US coalition against Iraq. 1994: Al-Assad’s brother Rifaat (vice-president since 1984) attempted to cease some control of Syria and was banished for a period of time. That same year, al-Assad’s eldest son, Bassel, died in a car accident and put Bashar al-Assad next in line. June 2000: President Assad died. July 2000: Bashar Hafez al-Assad became the 19th president of Syria and Secretary of the Regional Command of the Syrian Regional Branch of the Arab Socialist Ba’ath Party. He (a former eye doctor – ophthalmologist) is the Commander-in-chief of the Syrian Armed Forces. November 2000: Bashar released 600 political prisoners. September 11, 2001: Al-Qaeda Muslim terrorists attacked the United States, killed 2,996 civilians and took down the twin towers of the World Trade Center. May 2002: US government put Syria on President Bush’s list of ‘axis of evil.’ Weapons of mass destruction were discovered in Damascus. March 2003: US-Iraq War began; over 500,000 Iraqis were killed by 2010. May 2004: US imposed sanctions on Syria for support of terrorism; but failed to do anything to topple Bashar or stop Islamic militants from aiding terrorists in Iraq. 2007: Bashar was ‘reelected’ with 98% of the vote (received 99.7% in 2000). Later that April US HoR Speaker Nancy Pelosi met with President Assad. September 2007: Israel conducted an airstrike on a nuclear facility under construction in northern Syria. 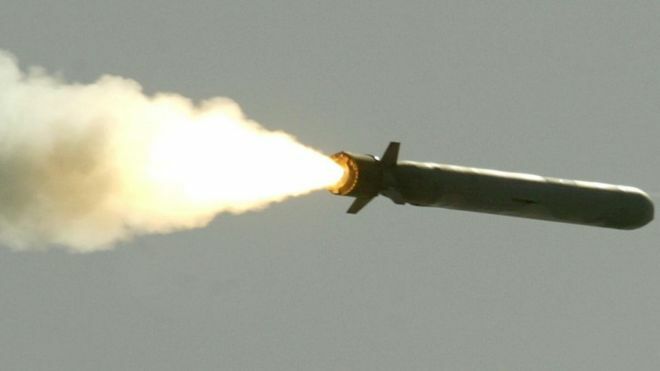 May 2010: The US renewed sanctions against Syria for supporting Hezbollah with Scud missiles and weapons of mass destruction. December 2010 to January 2011: The Jasmine Revolution or Tunisian Revolution that led to a democratization of Tunisia, Africa, encouraged Muslims (especially young adults) to take to the streets and protest for democracy in Syria (after 40 years of al-Assad family dictatorship). This began The Arab Spring (Democracy Spring) in North Africa and the Middle East. February 2011: Hundreds of citizens began to protest in the streets; it lead to thousands and a month later over 2% of Syria’s population would take to the streets on the same day. March 12, 2011: Thousands of Syrian Kurds protested on the ‘day of Kurdish martyrs;’ – 30 Kurds were killed by police during riots at a March 2004 Soccer game (Qamishli riots). March 15, 2011: ‘Day of Rage’ protests saw hundreds of protesters in Damascus and Aleppo calling for government reforms and democracy. Six protesters were arrested. March 16-17, 2011: Protesters in Daraa demonstrated against the military Police imprisonment and torture treatment of 15 teenagers. 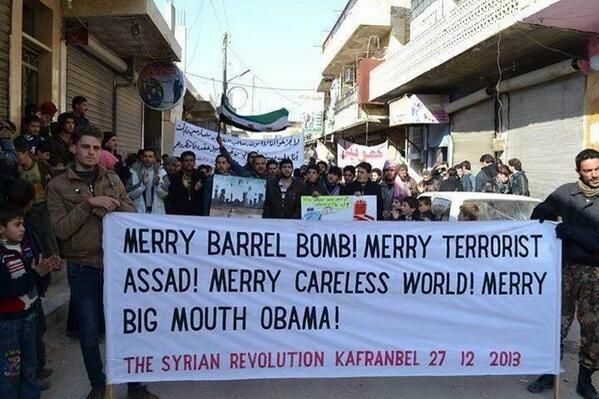 This would be one of the primarily sparks that lite the Syrian fire of Revolution. March 18, 2011: ‘Day of Dignity’ and ‘the Syrian Revolution 2011’ were posted on Facebook and after Friday prayers, protesters came out in four cities chanting: ‘God, Syria, Freedom.’ About 30 were arrested in Damascus and many in Homs. At least 2 were killed. The Military Police stormed into homes of suspects and took children from their parents on threat of death. According to The Human Rights Watch, “security forces opened fire, killing at least four protesters and within days, the protests grew into rallies that gathered thousands of people.” Al-Assad government Security force snipers killed 4 protesters in Deraa; among them was at least one child. Later others were taken and tortured and many killed. March 19, 2011: At the funerals of two Daraa victims, more than 10,000 people took to the streets chanting, ‘the blood of our martyrs won’t be forgotten.’ Security forces used tear gas and live fire to try and control the crowds. Six were killed and 100 injured. March 21, 2011: People shouted ‘God, Syria, Freedom; the people demand the overcoming of corruption… We are no longer afraid’ as they took one to be buried. March 22, 2011: Security police forces killed 4 protestors and overnight brought in reinforcements. March 23, 2011: About 40 civilians were killed by security police and military forces. Mobile phone connections to Daraa were cut off. March 24, 2011: About 20,000 attended funerals of 9 protesters killed the 23rd. March 25, 2011: About 100,000 people in Daraa demonstrated. Hundreds entered the governor’s building and burned pictures of Bashar and toppled a statue of his dictator father. March 26-31, 2011: Al Jazeera, Reuters and other news sources stated that Al-Assad had released about 260 prisoners. 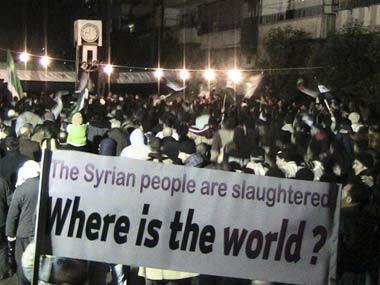 March 29, 2011: Tens of thousands demonstrated in Damascus, Aleppo, Homs, Hama and Al-Hasakah. According to the HBO release ‘Cries for Syria;’ a 30 year old female arrested, testified that about this time of those arrested by Al-Assad’s security forces, a 7-month pregnant women was beaten until she gave birth and then the 1 minute old baby was killed in front of several witnesses; and she stated that the men, women, young and old, were all raped by security personal. March 30, 2011: Al-Assad gave a speech addressing the Daraa situation and blamed it on the people saying, “They started in the governorate (province) of Daraa… the conspirators took their plan to other governorates… terrorists.” After that speech many who previously supported his regime, turned from Assad. April 1-15, 2011: Al-Assad’s forces cut off supplies (food) to thousands in Damascus. April 8, 2011: 19 more protesters were killed in Daraa. At that time, Amnesty International revealed 171 names of Syrian civilians killed since March 18. April 9-24, 2011: Protests continued throughout western Syria. April 25-May 16, 2011: Thousands of government army troops, tens of tanks and helicopters punished civilian protesters killing 244 civilians and 81 Freedom Army soldiers; and arrested about 1000 others. Families still have yet to see most of those arrested. 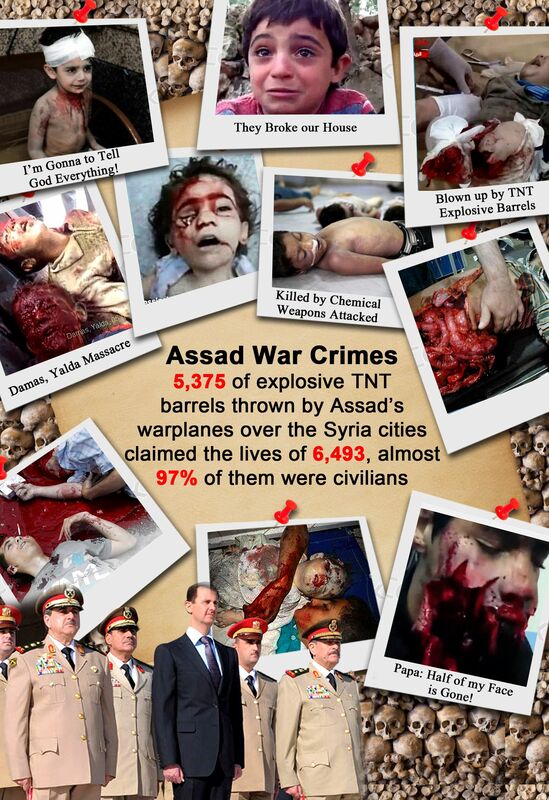 July-October 2011: President Assad sent troops to control various regions and hundreds more civilians were killed. November 2011: The Arab League voted to suspend Syria membership. 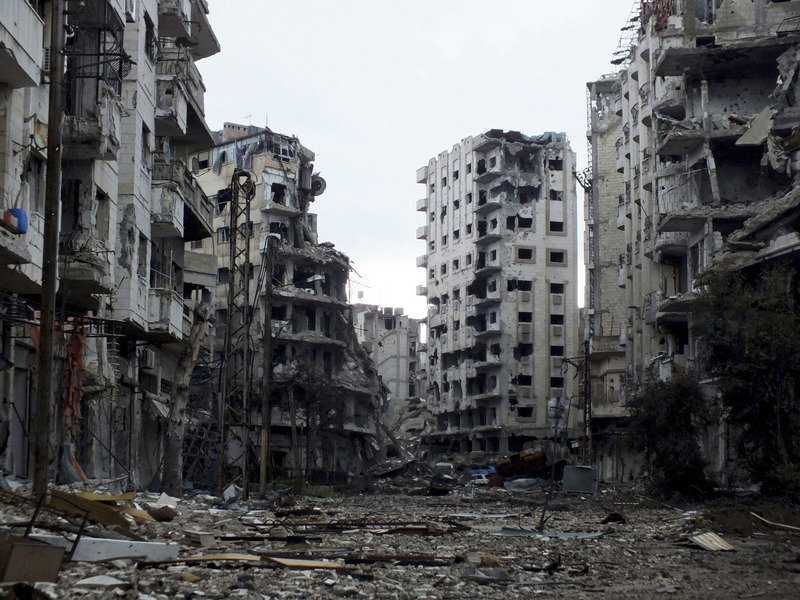 February 2012: The government began using more helicopters to bomb Homs and other cities. March 2012: UN Security Council endorses a peace plan agreed to by the US, Russia and China. But the words are only useless displays of weak political sorcerers that need to be exposed. It will take a million deaths before world leaders depose Assad and take control of Syria as the territory was after WWII – and this is bloody War. July 2012: The Free Syria Army (FSA) attacked security chiefs in Damascus and seized territory in Aleppo. At this time Syrian Observatory for Human Rights estimated that ‘tens of thousands’ of Syrian Army soldiers defected. August 2012: Assad and the Syrian government released 2,130 civilians from prisons in exchange for 48 Iranian terrorists. August 2012: After Syrian Prime Minister Hijab defected and testified of the weapons of mass destruction; U.S. President Barack Obama, stood up straight – looked into the camera – and warned (lol) President Assad that use of chemical weapons would tilt the US towards intervention. 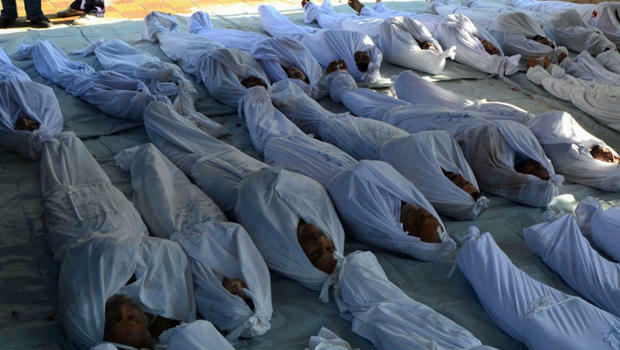 August 22, 2012: Assad had barrel bombs dropped on schools and homes; many children suffered and died from sarin gases. 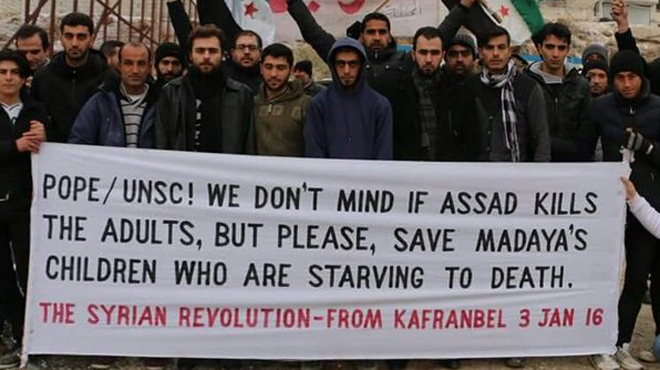 About this time the FSA began to control many regions and Assad had no power over them so he reached out for outside help. At first Syrian FSA and civilians welcomed ISIS fighters and leaders, but as soon as ISIS had control over the cities they raised their flags and turned on them. The documentary Cries for Syria showed ISIS fighters executing FSA soldiers and leaders – shooting them in the head, and even cutting one’s head off – which was so wicked that the producers cut out the spewing blood and rolling head. And ISIS not only turned on the FSA, they turned on the Syrian Army. December 2012: Months later the US, Britain, France, Turkey and Gulf states recognized the National Coalition Party backed by the FSA (Free Syria Army) as a ‘legitimate representative’ of Syrian people. About this time millions of Syrians became displaced and fled to refugee camps in Jordan, Turkey and Lebanon; as well as visas to foreign countries. Many nations accepted tens of thousands; however, the migration situation and vetting continues to be volatile. June 2013: 73 Syrian Army officers, 7 generals and 20 colonels, defected to Turkey with their families. December 2013: US and British forces suspended most of its support for the FSA. By this time the UN estimated that more than 60,000 people had been killed in Syria. January-Feb, 2014: UN peace talks failed (big surprise). June 2014: ISIS declared a ‘caliphate’ over the ancient city of Aleppo and other regions. 2015: ISIS seized control of many Syrian cities; Assad has little control over anything in Syria – all to his own making. May 2015: Jaish al-Fatah (Army of Conquest) Islamist rebels take Idlib Province. September 2015: Russia began air strikes in Syria. They lead nations to believe they are against ISIS, but their targets included anti-Assad rebels (FSA). By the end of 2015, the UN estimates that more than 250,000 people have died in Syria since 2011; and about 11 million (half of Syria’s population) forced from their homes. Nevertheless, Assad is still in power (office) and ISIS has much control and seeks an Islamic State under their control. All the while President Assad keeps ties with Hezbollah and Iran. March 2016: Syrian Army forces retake Palmyra from ISIS, but lose it again by December 2016. December 2016: Government Syrian Army forces, with Russian and Iranian support (part of the SCO – Who is the Shanghai Cooperation Organization (SCO)?) took back Aleppo – the largest city in Syria. January 2017: Cease-fire talks again: Russia, Iran, and Turkey gave it the old political try again before President Donald Trump came to office – vowing to destroy ISIS. The Obama administration was not present. March 2017: Russia and U.S. troops aid Syrian Army troops and Syrian Democratic Forces (SDF or QSD – most Kurdish) against ISIS. The SAA, Russians, Special Forces, Rangers and Marines backed with tanks and 155 howitzers seek to take control of Ragga and other territories. March 23, 2017: The High Negotiations Committee (HNC) of the National Coalitions for Syrian Revolution and Opposition Forces took part in Syrian Talks in Geneva. This is the 4th round of UN sponsored talks called by some Geneva IV. Mean while as world leaders sit in their comfortable safe rooms, the United Nations Special Envoy for Syria reminded the world that 300,000 civilians are at risk in Damascus and that most of them are totally cut off from humanitarian assistance – food, supplies, aid, etc – and subject to starvation. April 5, 2017: Death toll increased to more than 100 in Syria (25+ children); as Russian defense minister Igor Konoshenkov blamed Syrian chemical attacks on a leak from a ‘chemical warfare munitions’ cache hit by Syrian government air strikes. The U.S. government reported that Syrian President Bashar Assad was responsible for those killed and the 350+ injured. U.S. Sec. 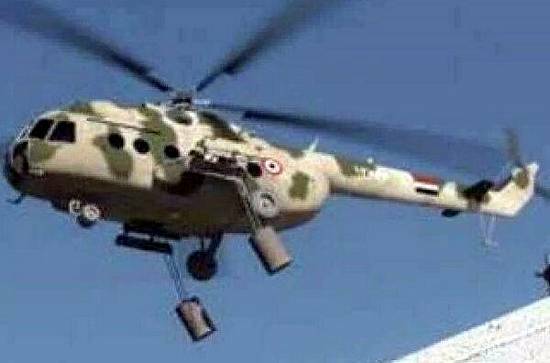 of State Tillerson said that Assad used banned chemical weapons and that ‘Al-Assad operates with brutal, unabashed barbarism.’ Russia failed to say they are a supporter of the Assad regime and that they supplied Syria’s government with the helicopters gunships and jets. The U.S. and UN fails to organize any real coalition to remove Assad and ISIS, though the Trump administration is actively hunting for Abu Bakr al-Baghdadi in Iraq (ISIS leader). The Pentagon says more troops may be needed – a teenaged Syrian orphan could tell you that. Trump said that the act was ‘an affront to humanity… (and Assad) ‘crossed a lot of lines.’ US Ambassador Nikki Haley told the UN Council, “the Joint… Committee found that (Assad’s Syrian regime) committed chemical weapons acts against their own people three different times… when the United Nations consistently fails in its duty to act collectively, there are times in the life of states that we are compelled to take our own action… How many children have to die before Russia cares.” Russia and others nations are delaying to call the UN to intervene immediately. Maybe world leaders may reach temporary peace, but they can’t destroy the hate and injustice already sown. The BEST SOLUTION: Put a US Naval Fleet on the Syrian coast: take control of the fly zones; send in 30,000+ well trained (voluntary) and equipped troops from NATO (meaning of course the United States sacrifices the most) root out and destroy ISIS by any means necessary (yes, including bribes and public torture – if we are afraid to do this; i am sure the FSA will be happy to assist), depose Assad, restore a mandate working with a temporary Congress made up of Representatives from all deserving Parties, call for new elections in 2018; and work for the people of Syria and let groups come in and clean up the rubble and set up needed hospitals, schools and orphanages. May 9, 2017: Despite opposition by Turkey; President Trump approved supplying arms to Kurdish YPG fighters to aid in the fight against ISIS. Dec. 2017: Syrian Regime bombs province of Idlib so intensely that tens of thousands have fled southern Idlib and Hama in one of the largest mass migrations in seven years. January 2 and 3, 2018: The Syrian Army, Hezbollah (‘Party of Allah/God’) and Iranian-supported jihadists took control of seven villages in the Beit Jinn area in Southwest Syria. Jan. 4, 2018: Russian airstrikes killed at least 25 civilians in Eastern Ghouta. Jan 11, 2018: The Syrian army captured another 34 villages around Aleppo. Jan. 14, 2018: Turkey’s President Erdogan accused the United States (a NATO ally of Turkey) of forming a ‘terrorist force’ on its border. Turkey considers the Syrian Kurds a terrorist group. As the Syrian Kurds fight against the Islamic State (ISIS/ISIL) and the Syrian Regime of Assad; it must also deal with Turkey’s military shelling them with their howitzers. Kurdish Syrian Democratic Forces (SDF) currently controls about 25% of the Syrian territory near Turkey and Iraq. Jan. 20, 2018: Turkish troops attack Kurdish forces (Rojava) and capture Afrin and Manbij. February 5, 2018: Syrian Arab Army (SAA), with their Tiger Forces (‘elite’ offensive units created by Col. Suheil al-Hassan in 2013), capture 8 villages from ISIL in northeastern Hama. Feb. 10, 2018: According to Zeid Ra’ad al-Hussein, UN Commissioner for Human Rights, “the past week has been one of the bloodiest periods of the entire conflict, with wave after wave of deadly airstrikes leading to civilian casualties in areas of Eastern Ghouta and Idlib. …Reports show that at least 9 medical faculties… were hit by airstrikes…” UN Human Rights Office received reports that at least 277 civilians were killed between February 4th and 9th – 230 of them (almost half were women and children) by Syrian army airstrikes. Feb. 18-23, 2018: First day the SAA (Syrian Army) launched air and artillery strikes. The second day saw about 72 airstrikes in East Ghouta (near Damascus) resulted in about 100 deaths and 500 injuries; with 5 hospitals attacked and damaged. By the 23rd, or 6th day the death toll was more than 400. The UN could not get a cease-fire due to Russian blocking and UN weak position against the genocide. Feb. 22, 2018: Turkish-backed Free Syrian Army capture 8 villages from the YPG (People’s Protection Units – former Rojava) U.S. backed Kurdish group. Feb. 25, 2018: Pres. Erdogan of Turkey claimed that 2,021 YPG troops were ‘neutralized’ (captured or killed) in Afrin. March 3-8, 2018: Turkish-backed Free Syrian Army with Turkish Armed Forces (TFSA/TSK) captured several towns and villages in around Jindires in northwest Afrin. March 15, 2018: Tens of thousands of civilians evacuated Eastern Ghouta in one of the largest Syrian Exoduses after government bombings. April 10, 2018: UN in usual deadlock as Russia and the U.S. vote against each other concerning investigation of Syria Chemical Attacks by the Syrian government. April 14, 2018: The United States, France and the U.K. attacked Assad’ Syrian forces in Ghouta. However, the Syrian Army declared eastern Ghouta liberated. May 3, 2018: U.S. freezes funding to aid the White Helmets (Syria Civil Defense) who rescued tens of thousands of civilians at the cost of over 200 of their own volunteers. May 7-10, 2018: Israel Forces (IDF) launched several missile attacks versus Iranian forces in Syria and Golan Heights (next to Syrian border). May 21, 2018: ISIS fighters (and their families) leave Damascus after 7 years of control; and the government forces take control. June 1-12, 2018: U.S. continued to led coalition air raids in Tal al-Shayer and parts of northeast Syria. July 6, 2018: Russian forces and support backed the Syrian Army in Southern Offensive reaching Jordon border and recapturing the Nasib Border Crossing. September 17, 2018: Russia and Turkey called for a demilitarized zone in Idlib (1 of 14 Syrian provinces). Sept. 2018: Russia brings into Syria S-300 anti-missile systems (to defend against threatened Israeli strikes). September 29, 2018: The Nasib Border Crossing into Jordon reopen for first time since Free Syrian Forces took it in 2015. October 15, 2018: After being closed for about 4 years, the Quneitra Border Crossing reopens into the Golan Heights. October 31, 2018: Turks continue the war against the Kurds in Kobani, Tell Abyad and surrounding villages (Northern Syria). November 1, 2018: The U.S. and Turkish forces conduct their first joint patrol in efforts of regain a better alliance. Yet, Turks continue to war against Syrian Democratic Forces (founded October 2015; anti-Assad / anti-ISIS alliance of mostly Kurds; pro-free elections) in the northern provinces of Al-Raqqa, Aleppo and Al-Hasakah. November 23, 2018: Syrian anti-Assad and anti-government ‘Fresh Radio’ host and his cameraman colleague (Raed Fares and Hammoud al-Juneid) were gunned down. December 2, 2018: Abu al-Umarayn, an ISIS/ISIL leader, was killed by U.S. drone strike in the Badia (Syrian Desert – 200,000 sq. miles – 55% of Syria, extending over 85% of Jordan and much of Saudi Arabia and Iraq). Now almost 2000 years later, its people are being persecuted by both internal and external forces. The UN stated the six-year conflict has killed more than 320,000 people and displaced millions. By some UN Envoy statistics as many as 600,000 have been killed. And it is very unlikely that Syrian President Bashar al-Assad’s representatives will yield to any significant agreement with the HNC and Free Syrian Army representatives at Geneva IV this week (March 2017). So far the Assad dictatorship is in its 47th year and leaders of the world are still shaking his hand. Bashar became president in July 2000 and remains so during their Civil War (January 2018).